There are more than 20 different beaches on Koh Samui. Some of them are highly pleasing, while others may unnerve you by how deserted they are. On the more populated beaches, you can take part in numerous water sports, have a massage, or enjoy a candlelit dinner on the sand. The sheer variety of island beaches can satisfy any holiday requirements, whether you wish to watch huge waves breaking into millions of tiny droplets on the rocks, or warm your feet on the finest white sand as you sit under a palm tree beside the quiet ocean. Below, you can find descriptions of the island’s most popular beaches, so that you can then choose the best way to have a rest in Thailand. Chaweng is the most popular beach among tourists visiting Koh Samui. This 7 km strip of sand is the longest and most developed on the island. As such it is widely considered to be the best beach in Thailand, as it is a real tropical paradise with fine white sand and a magical, turquoise blue sea. On Chaweng, visitors can find several of the best hotels on the island, as well as a lot of smaller resorts, bungalows and guesthouses as well as Koh Samui rental villas. There are also many restaurants offering dishes from different countries around the world, plus plenty of bars, discos, inexpensive tailors, and exotic Thai souvenir shops. In the evening, Chaweng turns into the center of nightlife for the island. Here, you can have a quiet candlelight dinner, enjoy a romantic evening on the beach, or visit a lively disco (including Reggae Pub, Green Mango and others). Despite being a noisy and lively place, Chaweng is also the classic vacation spot at the seaside, featuring magnificent views across the bay and out onto the Gulf of Thailand. The second most popular beach on the island, Lamai is located 10 km south of Chaweng. It is smaller and not as crowded, but is still developed enough to offer a huge choice of hotels, restaurants and shopping spots. There are also a lot of well known spas and other popular tourist attractions to be found. Lamai is not shielded from the ocean by any islands or headlands, which is why the sea in the area can be quite rough at times. This is especially so when you compare the water to the eternally calm Chaweng. Nevertheless, Lamai is still perfect for those who enjoy bathing, snorkeling and sunbathing. On the beach, you can also find delightful local services, including Thai massage, aqua bike rental, delicious local cuisine, and many other fun activities. In the evening, souvenir shops, restaurants and bars light up along the main street, turning Lamai into a colorful place full of pedestrian tourists and locals. If you prefer a more peaceful atmosphere, you can head towards the beach to admire the stars along with a symphony of natural seaside sounds. Between Maenam Beach and Big Buddha, visitors can find Bophut, a two-kilometer long sandy coastline with coconut palm trees lining the sea. It is a very pleasant place which has not been spoilt by civilization or the rapid development of tourism. Fishing boats and traditional wooden dwellings come together with a charming view of Koh Phangan which will attract fans of nature as well as the authentic Thai atmosphere. The quiet sea here is ideal for bathing and snorkeling. At the eastern point of Bophut there is, perhaps, one of the oldest and most interesting places on the island - Fisherman's Village. Ancient wooden houses with local shops, small restaurants and bars allow one to forget about the present day lifestyle and become immersed in the past. Each institution here has its own unique style and visitors can spend days simply exploring the different sights and sounds. Bophut is a good compromise for those who want to take a break from the hectic nature of the big city while still wishing to be close to the main entertainment centers. It is situated near Chaweng and within easy reach of major supermarkets such as Big-C and Tesco Lotus. On the northern coast of Koh Samui, far from the bars and clubs, there is a 5-kilometre beach with golden sand – Maenam. Though this part of the island is not too popular among tourists, it still has all the necessary conveniences, such as small shops and a farmers’ market. It is lacking a bit in entertainment though. Some may consider Maenam to be too quiet, but couples and families with children will appreciate a chance to laze on a quiet beach or to bathe in the sea without crowds of tourists about. The sand on Maenam is not as white and fine as on Chaweng or Choeng Mon and the sea is not so shallow, but there is still a very special atmosphere. Here, you can get an unforgettable sea view of the evening glow as well as the nearby island of Koh Phangan. From November to December, it is an excellent place for windsurfing. A very beautiful cape with several bays is located to the east of Big Buddha, a little separate from other parts of the island. This region of Samui is very tranquil, and contains mostly private residences. The extremely beautiful beach of Choeng Mon is popular thanks to its wide coastline covered with pure fine white sand. It is a paradise for children and adults because there are both small shallow areas for kids to splash about in and good, deep areas for adult bathers to enjoy. Besides water activities, the beach offers some excellent restaurants with both local and European cuisine. There are also many traditional massage salons in the area, where you can really relax in the hands of a skilled masseur while the sea breeze blows gently over your body. Another advantage of Choeng Mon is the abundance of shade in the morning and afternoon, allowing you to relax without worrying about protecting yourself against the tropical sun. During low tide, you can also travel through knee-deep water to the nearby uninhabited islet of Koh Farn Noi. Choeng Mon mainly offers Samui beach villas and middle and high-class tourist establishments. There are almost no backpackers. The town also has a very suitable location, as you can easily reach both Chaweng, and the main attractions of the island: the Big Buddha and the temple complex of Wat Plai Laem. 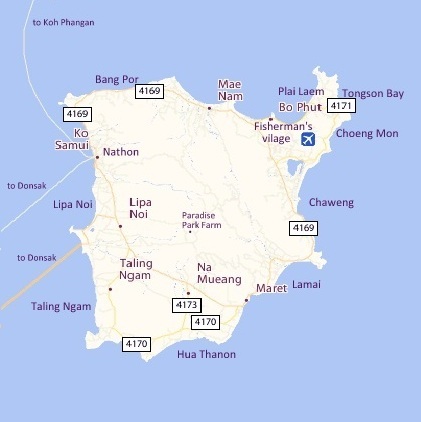 Lipa Noi is found on the least populated coast, located on the west of the island. This is a place where you can really admire the evening glow and feel the unique atmosphere of non-touristy Thailand, with its small dwellings of locals and very few travelers. Despite this, some of the most magnificent hotels and beach villas in Koh Samui are still situated along the Lipa Noi coast. Lipa Noi Beach is not as wide as the sandy strips of Chaweng or Choeng Mon. However, the sea here is still wonderful for those who like swimming, as there are no sharp coral reefs or stones. The sea depth varies depending on the season and place, as the beach is very long. One drawback is that there are not as many restaurants as on the other beaches in the area. However, the few coastal resorts and hotels certainly appreciate more tourists and will be ready to offer their cuisine to visitors from any of the nearby private villas to rent in Koh Samui. In 5 or 10 minutes by car from Lipa Noi, you will find Samui’s administrative center, Nathon, which features a Tesco Lotus supermarket and a fresh market where you can buy everything you need. The pier is also here and ferries depart once per hour to the mainland. Near the pier, you can always buy fresh seafood from the local fishermen or taste the latest catch in one of Nathon’s fine restaurants. This part of the island does not contain any nighttime entertainment. The pristine palm groves and deserted beaches will still give you a sense of being in a real tropical paradise though. Nearby to Lipa Noi, Paradise Park Farm can be found; a mountainside farm with birds, hares, deer and many other animals. This is a favorite attraction among tourists on the island.